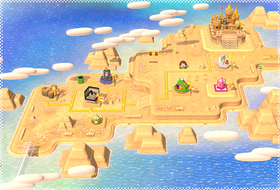 World 2 is the second world of Super Mario 3D World. It is a desert themed island and has sand blocks around the map. It lies northeast of World 1, south of World 3, southeast of World 4, east of World 5, and below World 6, World 7, and World 8. It has ? Blocks and a 1-Up Mushroom scattered around the map. The world contains five standard courses, a Mystery House, a Sprixie House, and a Castle. The boss of this world is Boom Boom. After finishing the Castle, the yellow Sprixie Princess will create a Clear Pipe to World 3. World 2-1 Conkdor Canyon A desert level with Conkdors. World 2-2 Puffprod Peaks A cosmic level with Touchstones. It requires 15 green stars to unlock. World 2-3 Shadow-Play Alley An underground level that introduces shadow gameplay and the Piranha Plant. World 2-4 Really Rolling Hills A grassy level with colored blocks, Galoombas and Skipsqueaks. It also contains a Mario switch. World 2-A Big Galoomba Blockade A small rock arena with Big Galoombas surrounded by lava. World 2-5 Double Cherry Pass A pink grassy level that introduces the Double Cherry and the Blocksteppers. World 2- Tank Bowser's Bullet Bill Brigade An auto-scroll tank level located on a long trail, that also introduces Cannon Boxes and Boom Boom. World 2- Mystery Box Mystery House Melee The first Mystery House where the player has to beat five Mystery Box levels on time in order to continue. World 2- Sprixie House Sprixie House A level where the player gets a stamp of a Sprixie Princess. There is a black area/square visible in the World 2 map. By changing the camera to a certain way, and going to the correct area of the coast, the player can see this. This page was last edited on March 10, 2019, at 00:10.